It is a weekend and we have a new Philippine Airlines promo fare to select international destinations! Available for booking from today until November 6 are PAL promo flights to Bali, Bangkok, Jakarta, Singapore, Port Moresby. From this seat sale, you can also get promo seats to visit Toronto and see the majestic Niagara Falls. Or travel to Vancouver and enjoy the spectacular parks and mountain scenery. Honolulu trips are also covered by the promo. Sale tickets are good for roundtrip travel and valid for November and December trips. The Philippine Airlines sale tickets are limited and subject to seat availability! Book for the PAL promo seats from November 4-6, 2016 at www.philippineairlines.com or purchase the tickets at the travel agencies or PAL booking offices. PAL sale tickets include the base fare, government taxes & fees and terminal fees. Fares are subject to change due to currency exchange rates. Quoted Philippine Airlines ticket prices are valid for roundtrip Economy class travel. The Philippine Travel Tax is not included in the ticket price. PAL Promo ticket is inclusive of 7 kilos hand carried baggage. The Philippine Airlines promo tickets are non-refundable and non-transferable. Don’t have a credit card? It is not a problem as you can book online and pay your tickets at Payment Centers of PAL. You may also buy the cheap flights from booking offices and travel agencies. PAL sale tickets are LIMITED and on a first come, first serve basis. 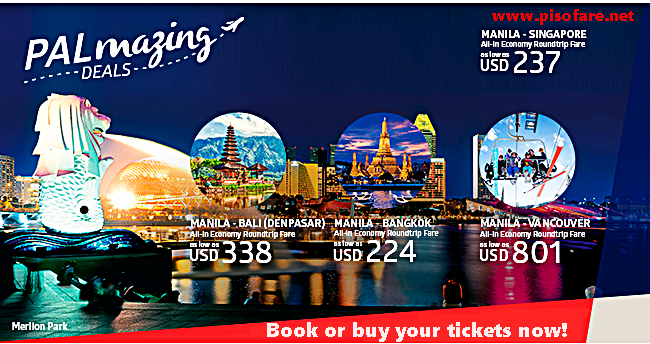 BOOK or BUY your tickets right away to get the low fares of Philippine Airlines! For more airline Promo Fare 2016 and PISO FARE 2017, LIKE and FOLLOW us on Facebook at PISO FARE TICKETS!! !